As I mentioned in the commentary for The Devine Adoratrice, this story came about by accident, but, as it turns out, a happy one. 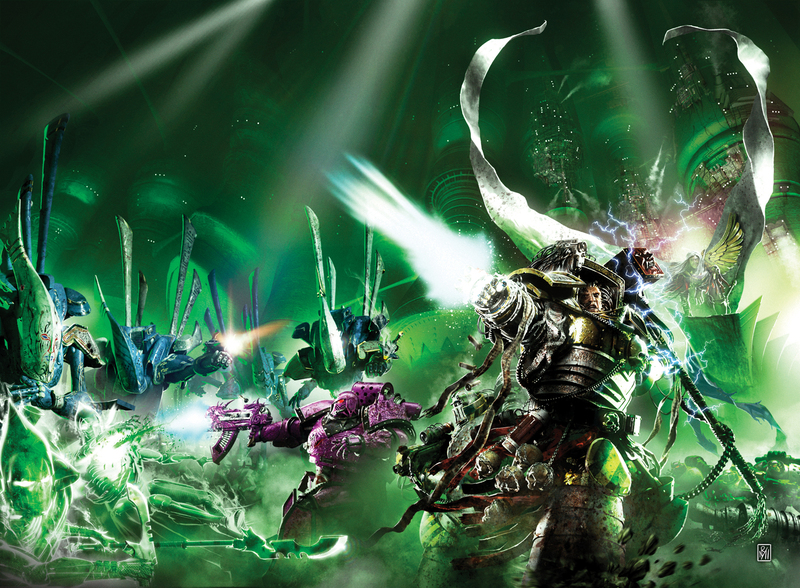 With the return of Loken to the Horus Heresy, I wasn’t completely happy with the way he’d just slotted back into the fold without seeming to bear any ill-effects of his near death at the (metaphorical) hands of a falling basilica. Someone who’d come back as a raving madman that thought he was the guardian of the gates of Hell, was going to take some serious time on a psychiatrist’s couch to get to the point where he could be considered competent enough to be sent to Caliban. Loken, to my way of thinking, was still broken, a man whose sanity was just a mask to cover the real horror of what was going on under the surface. He’s not a raving lunatic now, but there’s more to Loken than meets the eye. You have to wonder what Dorn and Malcador did to him when Garro brought him back, what trials or mental band-aids did they employ to get him back to a level of functionality…? After Caliban and the disastrous attempt to learn the Dark Angels’ allegiance, Loken has retreated into a little world of isolation, but the first cracks in what we think is his sanity start to show when he sees Tarik Torgaddon. Ah, yes, a hallucination you say. Hmmmm. Go read the story again and see what you think on a second reading. Do hallucinations leave bruises? Essentially, this was a kick up the backside for Loken, a way to get him back in the fight even though he knows he’s broken. He’s going to meet Malcador, but knows he’s not right and that he can’t be trusted. But he goes anyway. What does that say about someone’s mental well-being? What does it say about his true motives for going on the mission he’s about to be presented with?